Its beauty is indescribable, and no picture that we took could possibly do it true justice. 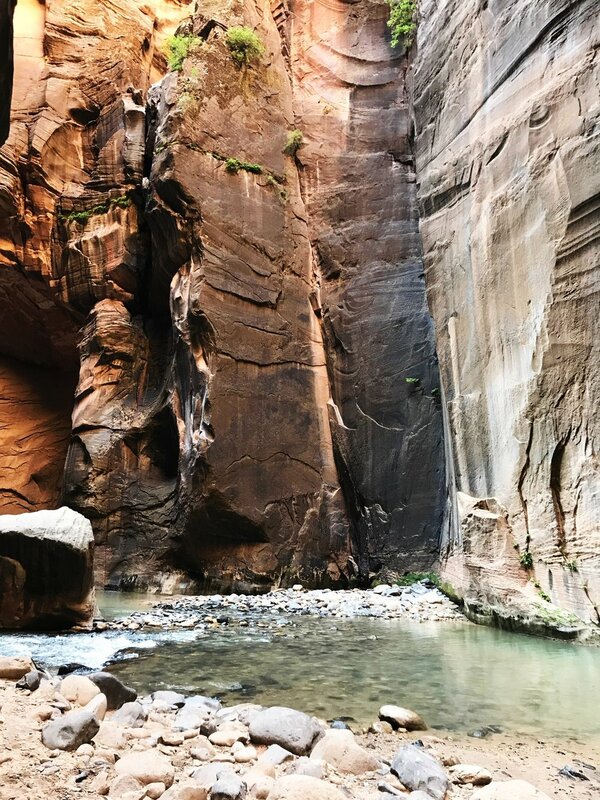 Zion National Park was, hands down, one of our favorite places we visited in the Southwest. I loved the majesty of this park; it is impossible to not be filled with awe over the natural world when you’re there. It is essentially a beautiful, lush oasis in the middle of the desert. 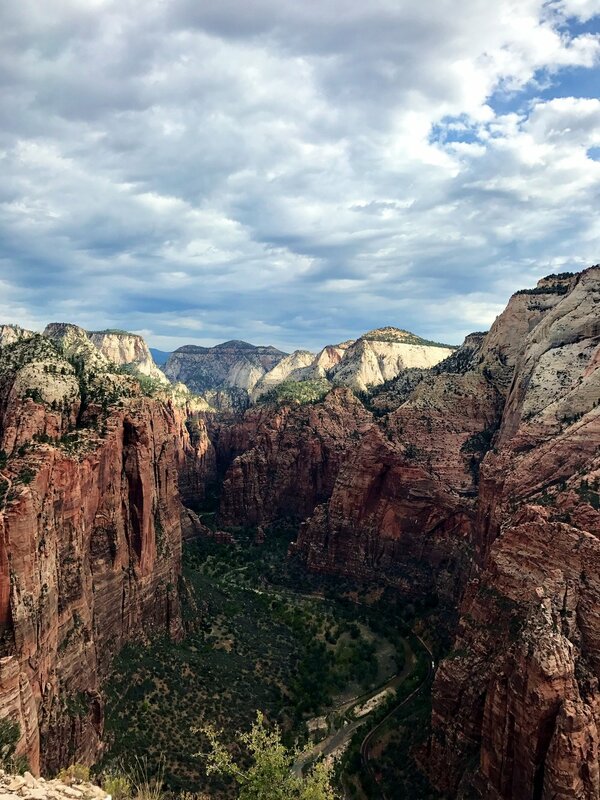 The range of terrain and scenery in Zion is what's most impressive—red and pink and beige rock formations that are beautiful and imposing, lush greenery, desert cacti, dark looming shadows, babbling rivers, and big, blue skies. The park itself is extremely accessible and well run, with a free shuttle system, very knowledgeable guides and Rangers, and a wide range of hikes and wildlife. Even the views from the shuttle bus and outside campgrounds are stunning! We woke up (a loose term given that we spent the night tossing and turning and deliriously dying laughing and murdering each other over the extreme temperature in our tent) well before sunrise to hike Angels Landing, one of Zion’s most famous trails on a nearly 1500-foot tall rock formation that juts into the sky and overlooks Zion Canyon. One of the best parts of this hike is that from the very first step onto the trail, the views are show-stopping and constantly changing. As we ascended through steep switchbacks, we looked behind us over the vast, growing canyon below. A part of me was prepared to chicken out before the end of this hike, given all that I’d been told about it and my recently developed fear of heights. This was only made worse when I got through the first stretch of chain-rope guided climbing and saw several people sitting and eating on a small plateau—I thought we’d reached the summit. Then, I heard a guy behind me say “you haven’t seen nothin’ yet.” To my horror, I looked upward to my right and saw tiny ant-like people ascending a thin and steep winding ridge that, from my angle, may as well have been a sheer cliff. This faux-summit we’d reached is known as Scout Lookout and is the point at which many people (with a fear of heights or otherwise) stop. But no part of me wanted to stop (I should have known my own dignity and/or ego would never let me turn around), so we kept going. 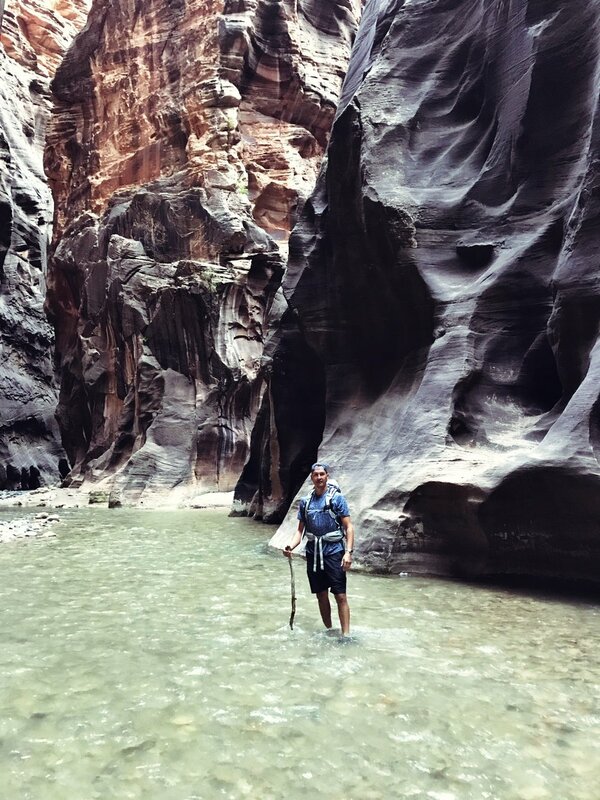 On the contrary, the Narrows hike was wholly, wholly different from Angels Landing. Again we set out before sunrise when the park was quiet and cool, but this hike held us in a kind of quiet serenity throughout its entirety. 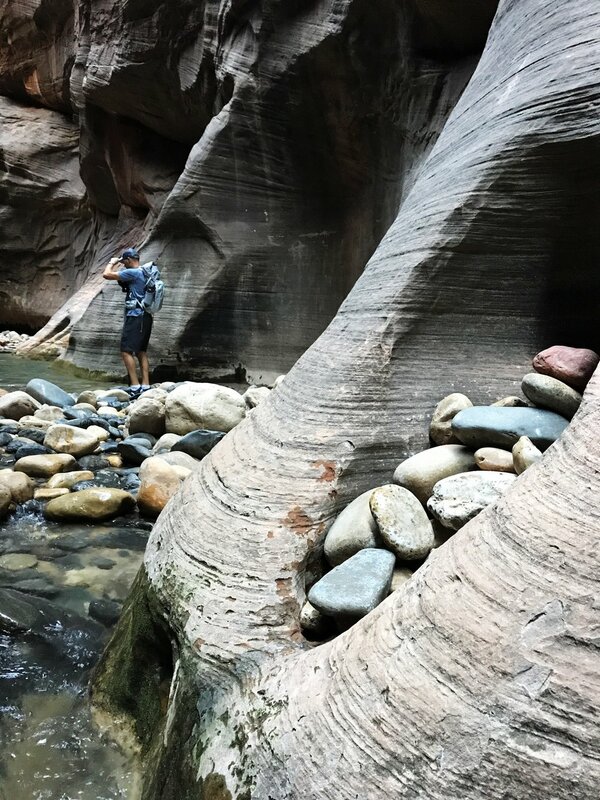 It’s an up-river hike through a slot canyon with walls that seem to grow taller and taller with each slow turn. We happily welcomed the cold water and shade after days of nonstop beating sun. We trudged through the cold water that ranges from calf-deep to thigh-deep (and even over-head in a few spots), and although we didn’t find it physically strenuous, every slippery step requires thought and patience (as well as a hiking stick for balance). 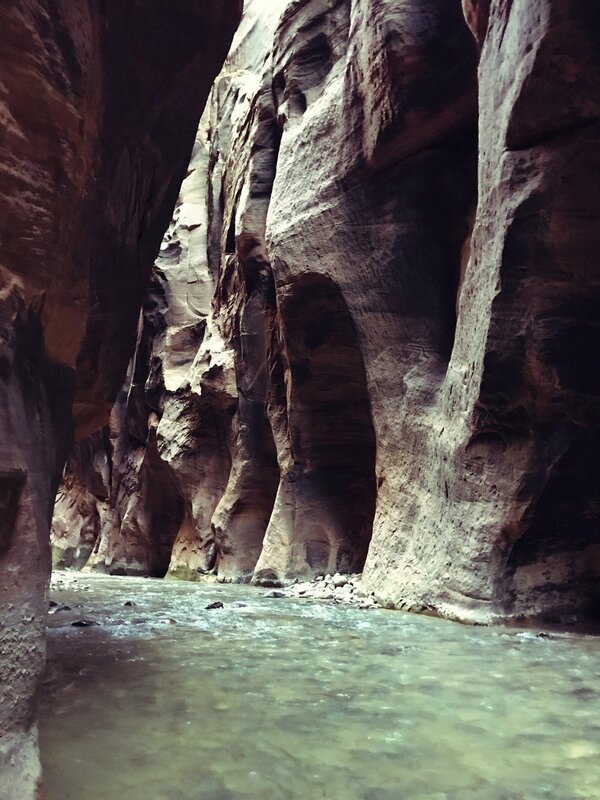 But similar to Angels Landing, the Narrows is as photogenic as they come. 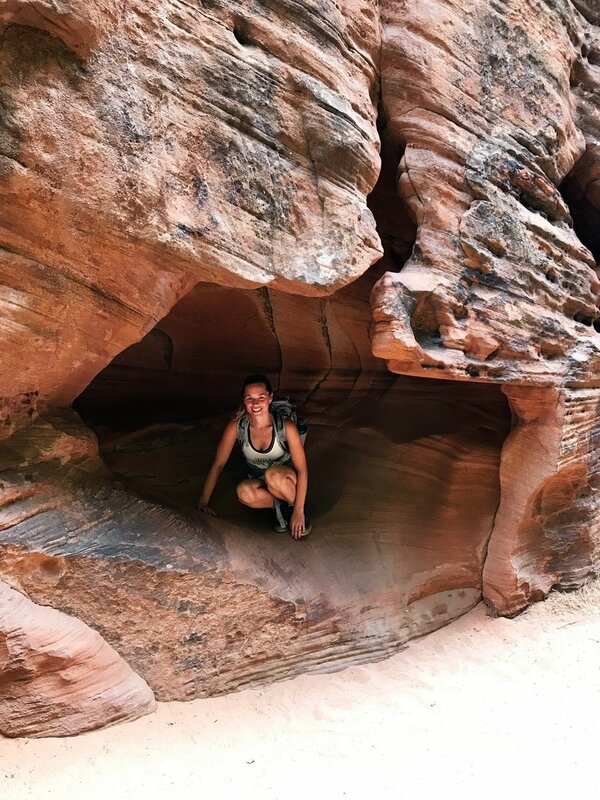 We were constantly stopping to pull out our cameras in hopes of capturing the artistic beauty of the curved walls, blue-gray water, and smooth rocks that make up the floor of the canyon. ...as are closed-toe water shoes! 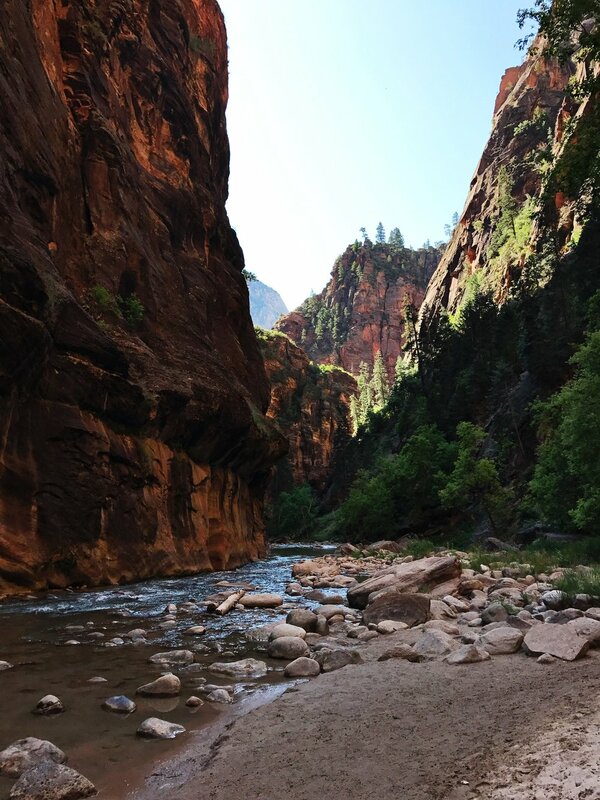 It feels equally important to say that we were, yet again, blown away by Zion in none other than our drive out of the park! We couldn’t get over how beautiful (and different) the scenery was when exiting the park on the east side. It’s difficult to explain, but you find yourself exclaiming your disbelief in what you’re seeing, the fact that it’s in the Unites States of America, in 2017, over and over again. This is also where we saw two Bighorn sheep crossing the road! It was a phenomenal wrap-up to our time in Zion, a can't-miss stop on a tour of the Southwest.